Andriambololona is founding director general of the National Institute for Nuclear Sciences and Technology (Madagascar-INSTN). 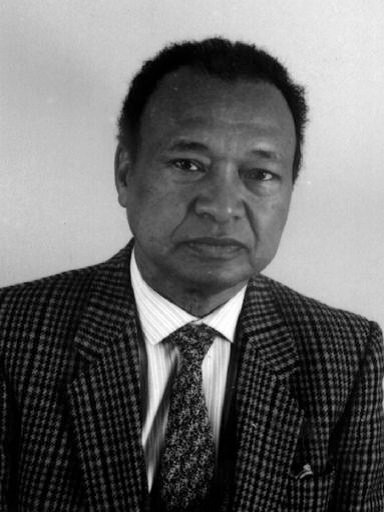 After being a researcher at the Centre National de la Recherche Scientifique, France, and obtaining his doctorat d’Etat (1967), he returned to Madagascar in 1968. He was former member of the Board of Governors of the Intl. Atomic Energy Agency (IAEA); scientific adviser to the President, Madagascar Republic; national coordinator for African regional Agreement (AFRA) in Nuclear Energy since 1989; and developer of INSTN (1992). He was awarded the Grand Croix de l’Ordre National Malgache and Commandeur de l’Ordre de Mérite de Madagascar. He is former founding vice president of the African Academy of Sciences, member of Académie Malgache, founding president TWAS Madagascar Chapter and part of many other professional associations including the IAEA and Intl. Radiation Protection Assoc. Keywords	 Nuclear physics; quantum mechanics; linear and multilinear algebra; spectroscopy; ethics and development; air and water pollution; history of Madagascar; radiation protection; scientific malagasy langage.